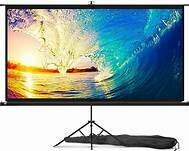 Portable projection screen. Our portable projection screen rentals work well with our LCD projector rentals and our video game system rentals. Our portable projection screen can be picked up or delivered.